They didn’t play there, but Edge, Bono, Mullen, and Clayton (left to right) posed for photos outside the long-shuttered Sans Souci lounge on West Peachtree in 1981. On a muggy May evening in 1981, a group of musicians pulled up to the curb across from the Fox Theatre and started lugging their instruments into a nightclub where the Georgian Terrace parking deck now stands. Until 1979, the venue had been known as Alex Cooley’s Electric Ballroom, and hosted Fleetwood Mac, Patti Smith, and Bruce Springsteen, among others. 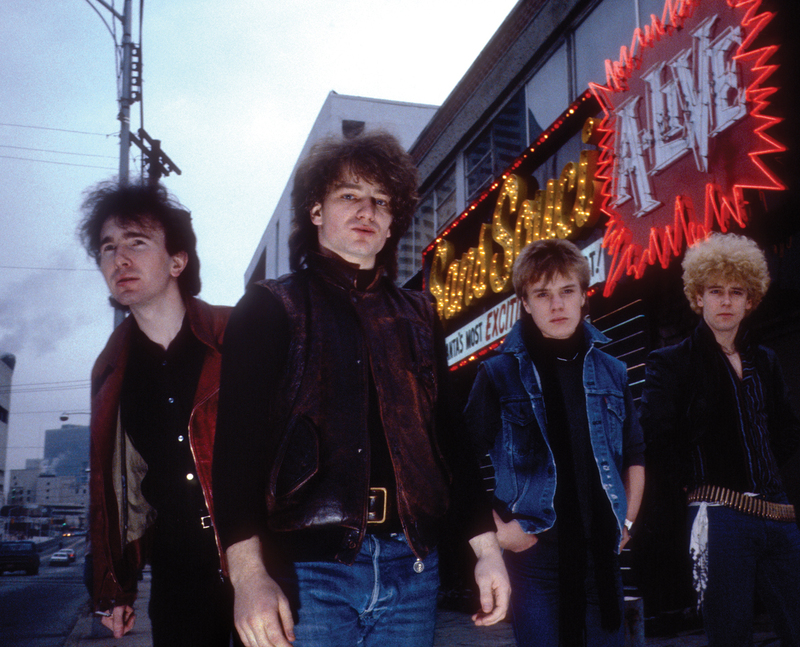 Its replacement, the Agora Ballroom, was a cavernous room where the four young men from the north side of Dublin—singer Paul “Bono” Hewson; bassist Adam Clayton; guitarist David “The Edge” Evans; and drummer Larry Mullen Jr., none older than 21—introduced Atlanta to their debut album, Boy, a collection of post-punk anthems that contrasted sharply with the New Wave dance beats, soft rock, and soul ballads crowding the Top 40 at the time. Seven months later, the band was back for a second show. In a 1981 interview with Bono for Muzik! magazine, Atlanta journalist Tony Paris wrote about the frontman’s desire to be heard on mainstream radio and for fans to leave room for his lyrics—about defiance, God, the death of his mother—to “sink in.” British photographer Adrian Boot, who toured with the band that autumn, captured images of U2 members mugging along West Peachtree Street in front of the former Sans Souci club, a jukebox dealership, and an old-school filling station. The next night, the band shook the Agora rafters with the single “I Will Follow” twice during its 60-minute set. Today, listening to a YouTube bootleg of that concert from 37 years ago reveals just how little U2’s core sound and spiritual evocations have changed in almost four decades. Atlanta, a forgettable stop to less perceptive musicians from across the pond, offered a complicated soul, divided by its Civil War past, civil rights present, and global aspirations. When U2 played the Agora on December 1, 1981, the city was coping with the aftermath of the Atlanta child murders. Later that same month, former United Nations ambassador Andrew Young celebrated his victory in the recent mayoral election runoff; Ted Turner’s fledgling CNN network was revolutionizing international news; the CDC developed the first definitions for a disease it would soon label AIDS; and the roar of jet blasts from the newly expanded Hartsfield airport, which would evolve into the world’s busiest, hummed in the distance. Atlanta went on to host the 1996 Summer Olympic Games, emerge as a center for global health initiatives, and grow a multibillion dollar film and music industry. For its part, U2 would become one of the biggest acts in rock history. On May 28, the band returns for its 15th concert here (at the Infinite Energy Center) in support of its 14th album, Songs of Experience, a mature counterpoint to the adolescent ruminations of Boy. Today, U2 writes and plays as if America is still there to be conquered, and at age 58, Bono’s lyrics about love and mortality also contemplate the fraught politics of the Trump era. Between 1981 and 1983, U2 performed four times in Atlanta. In 1984, the band released its fourth studio album, The Unforgettable Fire. The recording contained two songs—“Pride (In the Name of Love)” and “MLK”—about Martin Luther King Jr., whose legacy fascinated Bono after a writer at Rolling Stone gifted him a copy of the King biography, Let the Trumpet Sound. John Lewis was an Atlanta city councilmember at the time. John Lewis (U.S. congressman; civil rights leader): I don’t remember the exact moment I heard “Pride (In the Name of Love),” but I’m sure it was right after the song came out. I identified with [U2’s songs] because of the similarities I recognized between [situations] in America and in Northern Ireland. They had a Bloody Sunday there, similar to the Bloody Sunday we had in Selma. The struggle for freedom and liberation is universal. On April 29, 1985, when U2 rolled into the Omni on the Unforgettable Fire tour to play its biggest Atlanta show to date, the city had just hosted the inaugural International AIDS Conference. The band also made a visit to the King Center. Tony Paris (Freelance writer and former editor of Creative Loafing): By the time U2 played the Omni, the band could command the money it needed to put on a well-conceived show using the latest technology. It was chilling to watch them play “Pride” with photographs of MLK projected behind them. But I had to laugh, remembering what Bono said to me only four years earlier: “Tony, U2 is not a political band.” Maybe not in governmental terms, I thought, but they (or, at least Bono, in his lyrics) were certainly now engaging in what French philosopher Michel Foucault might have called political spirituality. Eight weeks after the Omni show, on June 22, 1985, U2 played on a bill with Athens band R.E.M. at the Longest Day music festival in Milton Keynes, U.K. Bono would recall meeting Michael Stipe for the first time as “that dance when two contemporaries kind of work around each other.” The friendship grew into what Bono labeled “one of the most important of my life.” On July 6-7, 1985, U2 and R.E.M. played at the Rock Torhout/Rock Werchter festivals in Belgium. Mike Mills (bassist, R.E.M. cofounder): U2 was big before we were, so they were the festival headliner, and we were playing earlier in the day, but we rode in and out [of the festival site] with them on their bus. Everybody took turns singing songs and Irish folk ballads. Less than a week later, U2 performed in London on July 13 to raise funds for Ethiopian famine relief as part of Live Aid, a televised concert broadcast which reached one-third of the world’s population and launched the band into super stardom. Michelle Nunn (CEO and president of CARE; former CEO of Points of Light/Hands On Atlanta): In the summer of 1985, I had just finished high school and was preparing for college. The performances at Live Aid [including U2] fit the zeitgeist of the moment. The concert inspired my belief that collective action—literally joining hands—could help change the world. Seeing this activism prompted me to imagine how I could be a part of creating change. U2 returned to Atlanta in 1986 as part of Amnesty International’s Conspiracy of Hope Tour, which supported releasing prisoners of conscience worldwide. U2 was writing its fifth studio album, The Joshua Tree. The day before the show, Amnesty held a press conference at the King Center, attended by Coretta Scott King; that night, Bono and Larry Mullen, Jr. jammed with members of Lou Reed’s and Peter Gabriel’s bands in the hotel bar at the Ramada Plaza downtown. U2 returned to the Omni in December 1987 for two shows in support of the Joshua Tree. The following year, the band paid homage to the American South as part of the Phil Joanou–directed documentary (and album of the same name), Rattle and Hum. By the time the Berlin-recorded stylistic departure called Achtung Baby was released in 1991 and the band hit the road in North America in 1992, the first Gulf War had come and gone, John Lewis was in his third term as a congressman, Maynard Jackson was Atlanta’s mayor once again, and Bono, behind thick shades and his new alter-egos The Fly, Mirror Ball Man, and MacPhisto, had begun prank calling the White House from the stage most nights during concerts on the “Zoo TV tour.” U2 played the Omni in March 1992 and returned that September to headline the first rock show at the newly built Georgia Dome with opening act Public Enemy and Big Audio Dynamite. Peter Conlon (president of Live Nation Atlanta): Alex [Cooley] and I wanted to make sure that we booked the first show there, and we wanted it to be special, so we asked U2. 50,000 people. Maybe the biggest show ever in Atlanta at that time, because Fulton County Stadium couldn’t hold those kind of numbers, nor Grant Field. It sold out right away. Thomas Wheatley (articles editor at Atlanta magazine): I was 12 years old. I was amazed at the stage: I remember cars on cranes, massive video screens, and platforms—all for a four-piece band. My mom let me buy a ridiculous amount of lighters on the off-chance everyone lit them during “One.” They did, so we did. The drunk woman standing in front of us had permed hair, and I accidentally lit a strand on fire. She didn’t notice. I don’t know why, but we left early—we must have had school the next day—while they played “Where the Streets Have No Name.” Walking through the basically empty corridors of the Georgia Dome made me feel like I was in the end credits of a movie. Chuck D (cofounder of Public Enemy; member of Prophets of Rage): I knew what Bono had to say about King, and he knew what I had to say. We weren’t going to sit around and talk about it. Bono comes along with the crew from Dublin and visits [Dr. King’s] crypt, which was becoming part of the tapestry of Atlanta at that time and almost [an afterthought] for people who already lived there. Anything Bono decided to do, especially as an outsider traveling in the American South at that time, I appreciated his effort. That tour taught Public Enemy so much about how tours should be run, and it was our first engagement with gigantic venues. Plus, we will always get to say we were the first artists to play in the Georgia Dome. 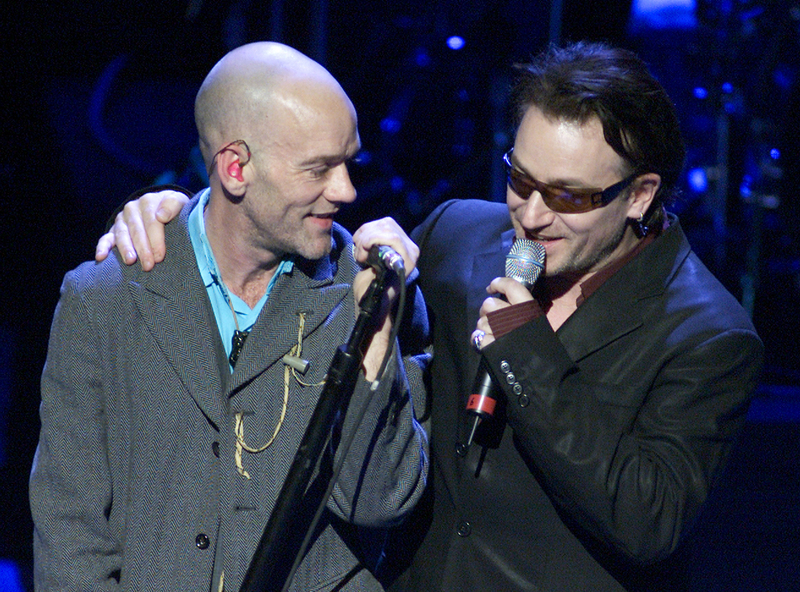 Bono performs with Michael Stipe of R.E.M. in 2002. As R.E.M. became U2’s rival for the title of “biggest band in the world,” the relationship between the bands strengthened. In 1993, not long before U2 released Zooropa, members of both bands performed at an inaugural ball for Bill Clinton, forming a one-night-only group, Automatic Baby. Bertis Downs (attorney and advisor to R.E.M. ): There had been a late-night hotel bar session a couple of nights before—Michael Stipe really loved the U2 song, “One.” Michael and Mike [Mills] were up late singing it together, and the idea came up of perhaps playing it at the MTV Ball with the two U2 guys in town (bassist Adam Clayton and drummer Larry Mullen Jr.). They thought, “We could do this.” The next day, calls were made and a rehearsal was arranged. We wanted to keep it a secret, which was possible before Facebook and Twitter. They performed it at the ball as Automatic Baby [referencing U2’s 1991 album, Achtung Baby, and R.E.M.’s 1992 album, Automatic for the People]. Four minutes, unannounced, and that was it. In 1997, U2 performed its PopMart tour at the Georgia Dome, with Bono also devoting his time to Jubilee 2000, the campaign for wealthy countries to wipe clean old debts owed to them by poor countries. In its January 2000 issue, Newsweek asked, sarcastically, “Can Bono Save the Third World?” U2 released All That You Can’t Leave Behind that October, eight days before the election of George W. Bush. U2 played two Elevation Tour shows at Philips Arena in 2001, one in March and one in November, bookending the terrorist attacks of September 11. An allotment of general admission floor tickets meant fans could get up close and personal with the band in a way they hadn’t been able to do since the early 1980s. Tai Anderson (President of the Atlanta chapter of the Recording Academy; former bassist for Grammy-winning band Third Day): When U2 came to Atlanta in 2001, I camped out all day long with the other fans so I could get a good spot on the floor “inside the heart” (the stage featured a heart-shaped catwalk). It was ironic, because Third Day had already performed our own shows in front of thousands of people. We would later headline Philips Arena ourselves, but we were fans, too. A few months after their second Philips Arena show that year, U2 played the Super Bowl and scrolled the names of the lives lost on 9/11. In that moment, U2 showed us what America means to the rest of the world. Mike Mills: U2 had come into town on their night off before the 2001 show. We had a dinner party at my house in Athens. I gave a toast about how great it was to have friends who had walked alongside us on a similar path for all of these years, because we could always look to each other for inspiration. I go see U2 shows, and it makes me want to write a better song or be a better musician. R.E.M. always thought being in a band was like being in your own little gang. Those are the friends you turn to in difficult times, and you always have each other’s backs. U2 and R.E.M. came from the same point of origin in terms of why we were in a band. It was really supportive to have them going through the world at the same time as we did. 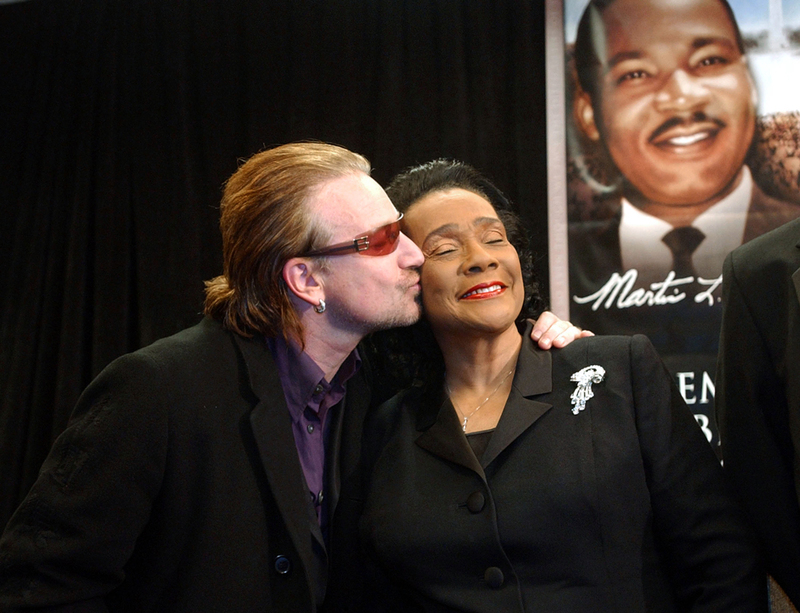 Bono kisses Coretta Scott King during a 2004 news conference in Atlanta. Bono was honored by the King Center during their annual Salute to Greatness awards dinner. In January 2002, Bono and Bobby Shriver founded DATA (Debt AIDS Trade Africa), funded in part by the Bill and Melinda Gates Foundation. In March, Bono visited George W. Bush at the White House to discuss AIDS, and the following January, Bush announced the President’s Emergency Plan for AIDS Relief, a health initiative that would also raise the profile of the Atlanta-based CDC. Bono’s charitable work increasingly intersected with Atlanta leaders. Helene Gayle (CEO of Chicago Community Trust; former CEO of CARE): Lots of celebrities get involved with philanthropy, but Bono stands out because he goes deep on policy. He knows about storytelling. I talk in wonkish terms, but he taps into the human spirit. On January 17, 2004, the King Center honored Bono with the Salute to Greatness Award. Bono, in his acceptance speech, spoke of how the Irish “despaired for the lack of vision of the kind Dr. King offered people in the South in their struggle. . . . I wrote ‘Pride (In the Name of Love),’ in a way out of that feeling.” Coretta Scott King died in 2006, but Bernice King, youngest child of Coretta and Martin Luther King Jr. and CEO of the King Center, says her mother was especially fond of Bono. Bernice King: There are few people in life [outside of our family] whom my mother took to and saw as a son of sorts. Bono is one of those. She found him fascinating. She was a little giddy. She must have picked something up in his spirit that attracted her. The King Center hosted Bono, John Lewis, and Chris Tucker in a roundtable with AIDS activists, doctors, and scientists to discuss how to tackle the AIDS epidemic in Africa and rethink the impact of international aid. David Ray (vice president for policy and advocacy of CARE): At that point, we were coming out of the post-9/11 era, which was a time when the U.S. was still looking inward and the world felt like a place in chaos. There was a group of about nine of us international humanitarian organizations who got together to discuss how the U.S. engages in the world and how to help with the AIDS crisis, poverty, and hunger. [Along with DATA and the Christian advocacy organization Bread for the World], we became part of the framework for Bono’s organization, ONE. ONE is a nonpartisan organization cofounded by Bono in 2004 which lobbies governments to fund disease eradication and poverty reduction in poor countries. ONE and CARE advocates engaged both John Lewis and Georgia’s U.S. Senator Johnny Isakson in cosponsoring bipartisan legislation around food security and public-private partnerships in Africa. Third Day also became involved with ONE. Since 2004, U2 has released four albums, played two nights at Philips Arena on its 2005 “Vertigo tour” and returned to the Georgia Dome in 2009 with the “360 tour.” On December 1, 2011–thirty years after U2 played its second Atlanta show at the Agora–Coca-Cola announced a partnership with (RED), Bono’s product initiative to fight AIDS. That same day, Bono attended a World AIDS Day event in Washington, D.C. with President Obama alongside CARE’s Helene Gayle, CNN’s Sanjay Gupta, and Coca-Cola’s Muhtar Kent. In 2016, Bono met Jimmy Carter when both men were honored for their humanitarian work.